The popular tourist site of the elephant orphanage in Pinnawala is on the way to Kandy from Colombo. The orphanage is just about 90 km away from the city of Colombo towards Kandy not making it tiresome on road. Departing early would be ideal if you’re planning on spending some quality time with the baby elephants. The orphanage which was established in 1975 by the government started bringing in and adopting the wounded and sick elephants who were homeless and abandoned. Every year many elephants get shot by angry farmers for ruining their crops and harvest. Thus, the elephant orphanage of Pinnawala is never outnumbered. Drawing the attraction of many tourists every year has led to a well-planned tourist friendly schedule in the orphanage. The new comers to the herd are welcomed with warm gesture by the senior elephants making it easy for both the new comers and elephant trainers. Each elephant is monitored by their behavior and individual files are maintained. The orphanage will be opened from 8.30 am until 6.00 pm. All visitors in the orphanage would experience an unforgettable touch for the rest of their lives. Baby elephants are fed with bottled milk in the morning as a kick starter for the rest of their playful day. The obedient juniors let you feed them with bottled milk during their breakfast time. 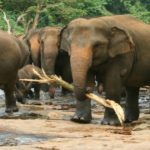 Enjoy this only chance to volunteer at an elephant orphanage in Sri Lanka and get closer to the baby and jumbo elephants and understand their thoughts. 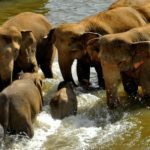 All elephants will then be taken to the Maha Oya River and tourist get to observe the elephants bathing from the viewing area. The playful baby elephants dance and play in water like it’s the first time everyday. 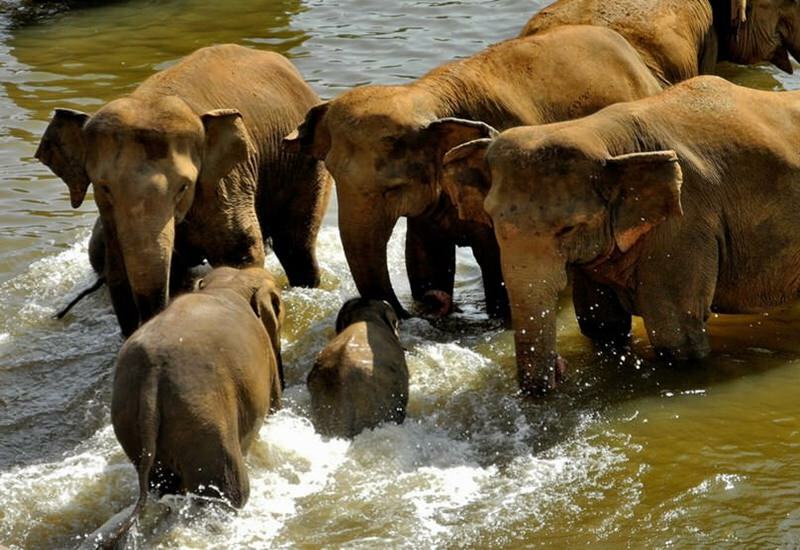 Capture the unseen while the little ones bathe and the senior elephants encourage them. Back in orphanage visitors can also witness the elephants’ play time where they show off at best to all their visitors. Tourists can also capture their heart felt moments as well as take pictures with the elephants while holding their trunks or getting on their back. Pinnawala is one place where it could be considered as a safe haven for all these homeless, hurt and wounded elephants. The beautiful baby elephants and jumbo elephants welcome all their visitors to enjoy a day with them. Do not miss out this opportunity to observe sights that one shall ever see and also make this your chance to show your affection, love and care to the really needy baby elephants while feeling contented throughout!